Hello. I'm Tsuneo Urisu, and I’m working as a visiting professor and researcher at Nagoya University. Thank you very much for your interest in my research. I started this project because I need your help. The purpose of this project is to gather funds to create an analyzer for cellular activities that will reveal the mechanism behind the onset of ALS. As soon as this device is completed, the development of new drugs for treating ALS and new treatment methods will be able to advance dramatically. Why is this device necessary? What will happen when the device is completed? And why did I choose to develop this device? I am afraid that the explanation will get somewhat technical, but I would be grateful if you are willing to read it. Completed PhD at the Department of Chemistry, School of Science, University of Tokyo in 1973. Became a researcher at the Musashino Electrical Communication Laboratory, Nippon Telephone and Telegraph Corporation (NTT) the same year. In 1983, became researcher/group leader for NTT LSI Laboratory. In 1992, became professor at Institute for Molecular Science, National Institute for Natural Sciences. 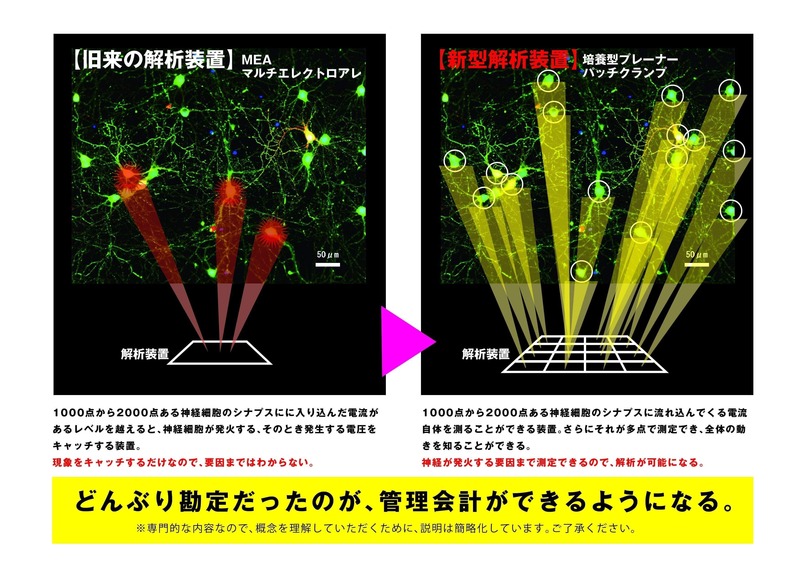 In 2011, became professor at Nagoya University Innovative Nanobiodevice Research Center. In 2015, became visiting professor at Nagoya University Green Mobility Collaborative Research Center. In 2016, became visiting professor at Nagoya University Innovative Research Center for Future Society, a position held to the present. *Details of research areas, achievements, patents, etc. are stated at the end of this text. What lead me to this research? When I was 22 years old, I decided to become a researcher because I was interested in deeply examining the unknown. Looking back on my fifty-year career as a researcher, I have studied quantum mechanics, relativistic theory, laser development, photodetector development, the fundamentals of surface science, and diseases (namely, neurodegenerative diseases). Although many researchers usually pursue one or several specific fields, I have unexpectedly moved across a very wide range of academic disciplines. My turning point was in 2011. Someone close to me came down with ALS. I began this work on his request that I research the cause of the disease and the development of its treatment. However, that person unfortunately passed away before I could report the outcome of my work. In order to fulfill his wishes, I want to make this project successful, develop equipment, and find the cause of the disease’s onset. I have also met with his bereaved family members; having seen their deep sorrow for myself, I strongly felt the need to complete this research in order to prevent any more people from having to experience such pain. For my research on the cause of ALS, my 50 years of research experience is all helpful, and I feel something akin to　destiny. I feel that I have done research in such a wide range of fields up until now all to lead me to this research. In addition, I have been blessed with encounters with leading scholars in various fields and many people known as authorities. I am grateful for these encounters and these people’s cooperation, and I and the members of my laboratory are ready to conduct this research with all our strength. “Will you pour a bucket of ice water over your head or make a donation?” There are many people who know the movement that started in the United States in 2014 with such a rule. 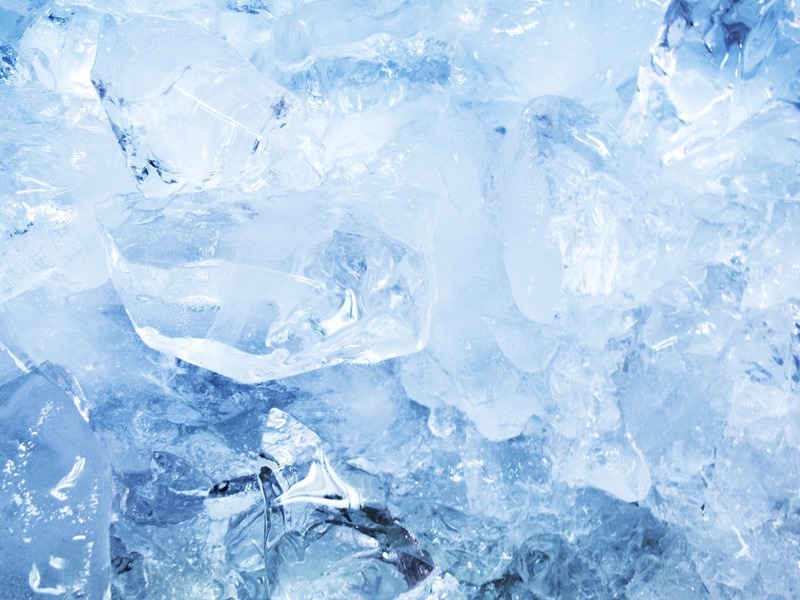 That’s right—the Ice Bucket Challenge. Celebrities and politicians of various fields posted videos of themselves pouring ice water on their heads on social media. This challenge spread to other countries and became a social phenomenon all over the world. The purpose of the movement was to raise awareness of ALS and to raise money for its research. Amyotrophic lateral sclerosis, or ALS, is a disease in which motor neurons that convey commands from the brain and peripheral nerves to muscles are invaded. It is one of the diseases designated in Japan as an intractable disease. When one develops ALS, the muscular strength of the whole body declines, and the ability to walk and talk at will are lost. The nerves necessary for breathing are also impaired, and it becomes impossible to breathe by oneself in three to five years of onset, making assistance with a ventilator necessary. However, sensory and autonomic nerves are not affected, so the senses, memories, and nerves that control intelligence remain normal. In other words, even though the consciousness and feelings of people with ALS are clear, they cannot hug those important to them or bat away insects that land on their face with their own hands. It is said that 1 in every 100,000 people will develop ALS. 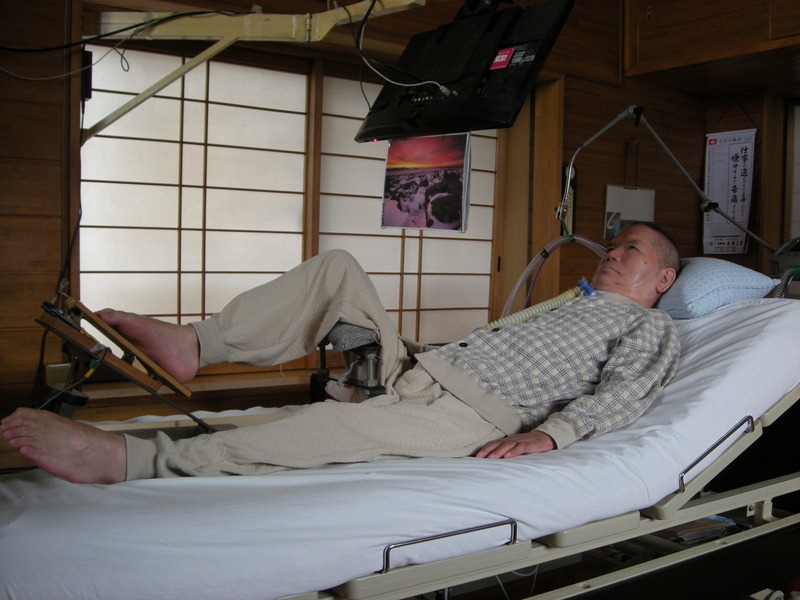 Currently, there are about 8,300 patients in Japan and about 120,000 patients worldwide, but no treatment has yet been found. Why can’t we find a treatment method for ALS? To put it plainly, it’s because we do not yet know the cause of the disease. As I mentioned earlier, ALS is a disease in which “motor neurons, which convey commands from the brain and peripheral nerves to the muscles, are invaded.” Phrased like this, it may seem like the cause is understood, but the reason why motor neurons are affected remains unclear; the mechanism has not yet been found. We need two things to clarify the cause. One is a sample of a live affected area. Such a sample cannot be collected from actual patients, but this problem is being solved by the development of iPS cells. So, what is the other thing necessary to clarify the cause of ALS onset? The answer is a cell analysis device, which this project aims to create. We already have a device to analyze cells individually. However, the brain is a very complex thing made up of countless and diverse nerve cell networks. In ALS and other intractable neurological diseases, genetic mutations generate on this complex network and breakage of the information-transferring parts are distributed across the mesh of nerve cell networks. This distribution varies among individuals, so in order to determine the mechanism behind disease onset, it is necessary to simultaneously analyze multiple cells on a network. From prior research, we discovered a technology that can accomplish the following three items necessary for analysis. ◎Simultaneous measurement of multiple points: Simultaneous measurement of cell activity (ion channel current) at more than 10 points. The breakage of information-transferring parts can be found. ◎Imaging: Image analysis can be performed on the same cells for which activity is measured and on the surrounding cells by staining. It is possible to detect the breakage of parts that cannot be observed with the ion channel current. ◎Ability to analyze genes: Analysis of intracellular genes conducted on the same cells as those for which ion channel current was measured. Information on the cause of the disease can be obtained. This project is the first in the world to create an analysis device that incorporates these technologies. Naturally, development costs a lot of money. We estimate that we need about 6.5 million yen to manufacture a prototype and demonstrate its usefulness. Of course I am investing my own funds, but my funds alone are not enough. Clarifying the cause of ALS and overcoming neurological diseases is a goal shared by people all over the world. Could you lend us your strength so we can achieve this goal? There may be people who wonder why I can’t get funding from my university or the nation. I think that’s natural. However, I retired from the university (Institute for Molecular Science) about eight years ago and am now a 73-year-old visiting professor. National funding generally has a stipulation that it must prioritize young researchers; my age of 73 years presents a difficult obstacle. Until the age of 65, I applied for various grants and subsidies by myself and gathered research funds, but these funds will also run out next year. If a prototype can be created, I can establish a company, collect funds in the form of investment, and start working on a practical machine. Thus, we would like to produce a prototype as soon as possible. I discussed this project with colleagues, friends, and acquaintances, and many people agreed with its goal. Here, we will share messages of support from three people. The creation of this device is sincerely wished for by humankind. Hitachi, Ltd., Fellow. Inventor of next-generation DNA sequencer. human genome decoding in 2000. Director General of the National Institute for Physiological Science. Research involves the relationship between neural circuit functional analysis of the brain and disease. Professor of the National Institute for Basic Biology. Discovered the Na channel. World authority on systematic research of brains. There is a person who continues to draw pictures even as it gets more and more difficult due to the onset of ALS. His name is Yoshiaki Nagao. He lives in Tokushima prefecture and served as the fourth president of the Japan ALS Association. 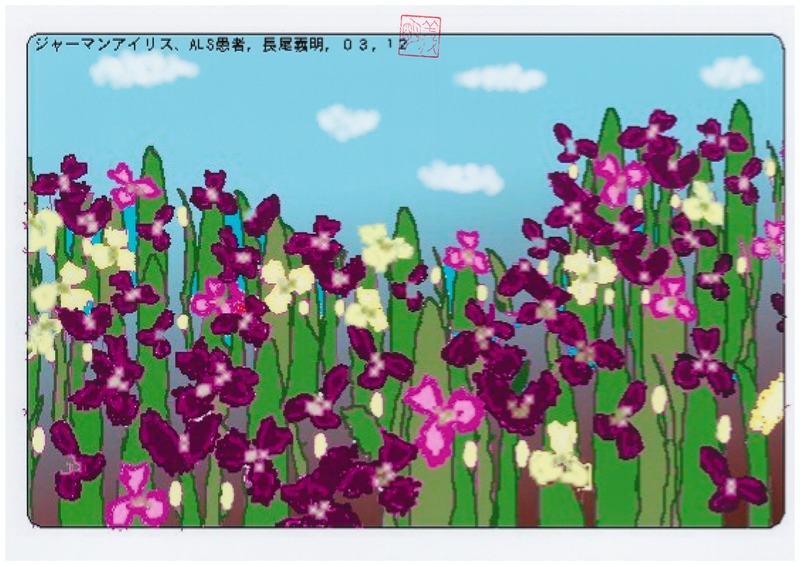 I was impressed by the picture of an iris that he drew, and I was given the opportunity to go to Tokushima to see him. Mr. Nagao was formerly the president of a company in the manufacturing industry. He came down with ALS about 20 years after his marriage, and he has continued to fight the illness for the 28 years thereafter under the care of his wife. He draws pictures with his foot, as shown in the photograph. It takes about 100 hours to draw one picture. His work is astounding; it has been published in an art book that collected 600 of his pieces (published by EmileSoft Ltd.). When I told him about this project, I received the following message. I looked over the design drawing of the prototype device. and hope that day comes as soon as possible. 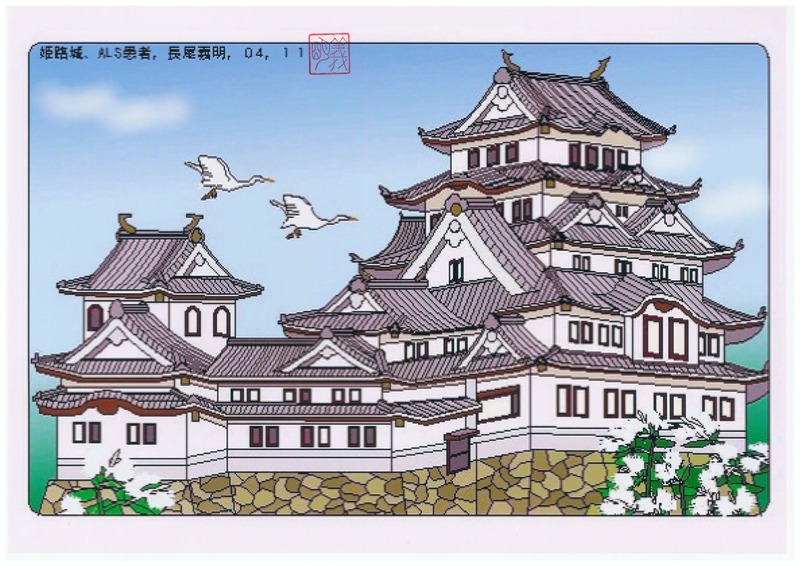 We have been given the iris, Himeji Castle, and white tiger paintings, and we will use them as backer rewards for this project. As the fourth president of the ALS Association and a patient of ALS, Mr. Nagao has placed great expectations on us. In order to meet those expectations, we hope to make this project a success. It costs about 6.5 million yen to make a prototype. 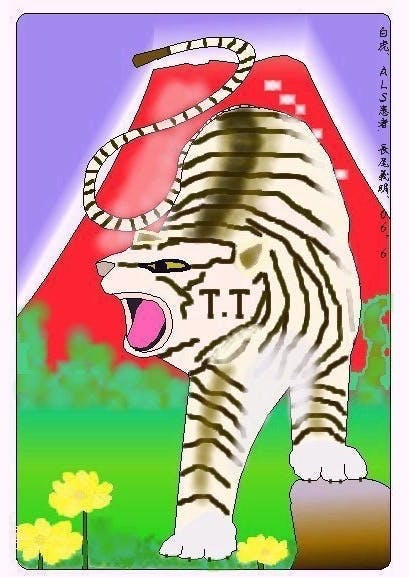 Even if I invest my own money and get money from a fund that even those who are 65 and older can apply for, I will run short by 2 million yen. We would like to ask for everyone’s contribution to compensate for this amount. Thank you for reading this far. Because this topic can’t be discussed without getting into technical details, there were probably points that seem difficult to understand. I express my sincere gratitude to you for reading all the way despite that fact. The treatment and cure of intractable diseases of the nervous system, including ALS, has been a wish shared by humankind for over 150 years. The completion of this project should be a major step toward clarifying the mechanism behind disease onset and toward developing treatment and new drugs. For details of past achievements, please refer to our homepage. (http://www.urisu-group.jp). Proved that, in the synchronous mode-locking of laser oscillations, a very short light pulse stably exists thanks to noise (1983). Invented a new nanofabrication technique for semiconductors using vacuum ultraviolet light (1988). New clarification of the formation mechanism of amyloid β aggregates in the brain in Alzheimer’s disease (2010). Invented a new analytical device for clarifying the causes of neural and psychiatric disorders and for the creation of drugs (2014). 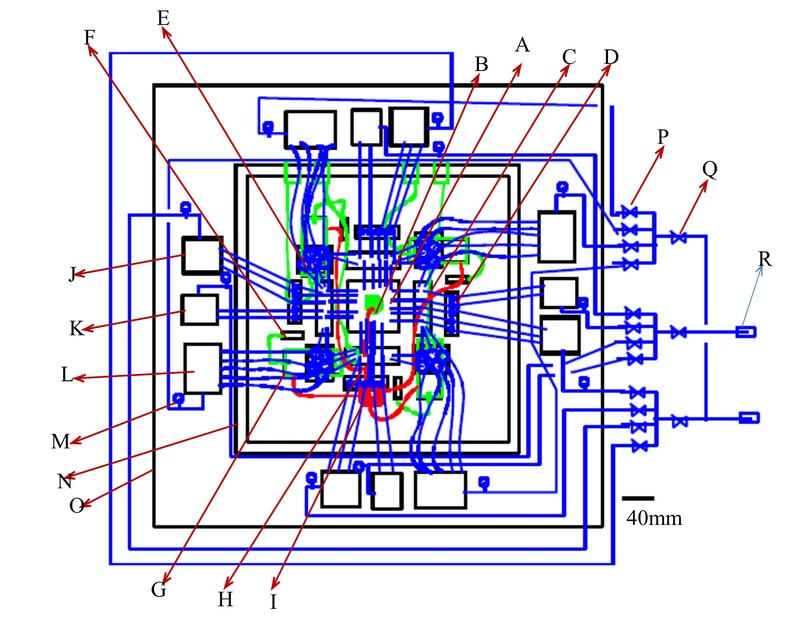 Application by Japan Science and Technology Agency, PCT/JP2012/081556; Inventors: Tsuneo Urisu, Wang Zhihong, Hidetaka Uno, Obuliraju Senthil Kumar, and Yasutaka Nagaoka. Application by Japan Science and Technology Agency, PCT/JP2013/057976; Inventors: Tsuneo Urisu, Zhihong Wang, Hidetaka Uno, Yasutaka Nagaoka, and Miho Saito. Application by Japan Science and Technology Agency, PCT/JP2014/072808; Inventors: Tsuneo Urisu, Zhihong Wang, Hidetaka Uno, Yasutaka Nagaoka, and Kei Kobayashi. Application by Japan Science and Technology Agency, PCT/JP2015/051905; Inventors: Tsuneo Urisu, Zhihong Wang, Hidetaka Uno, and Yasutaka Nagaoka. “Microfluidic device with microvalves,” Application No. 2013–228299; Application date: November 1, 2013; Inventors: Hideki Sato, Tsuneo Urisu, and Hidetaka Uno; Rights holders: Nachi-Fujikoshi Corp, Nagoya University. “Cell light responsive control substrate, cell light responsive control device, cell light responsive detection device, cell light responsive control method, and cell light responsive detection method,” Application No. 2009–079411; Application date: March 27, 2009; Inventors: Tsuneo Urisu, Hidetaka Uno, and Toshifumi Asano; Rights holders: Institute for Molecular Science, NINS. “Substrate for patch clamping device, flat substrate type patch clamping device and cell ion channel activity measuring method,” Application No: 2008–046145; Application date: February 27, 2008; Inventors: Tsuneo Urisu, Hidetaka Uno, and Toshifumi Asano; Rights holders: Institute for Molecular Science, NINS. “Method and apparatus for collecting cell contents,” Application No: 2017–160962; Application date: August 24, 2017; Inventors: Yuzuru Takamura, Tsuneo Urisu, Shinsuke Ishigaki, and Hidetaka Uno; Rights holders: Nagoya University, Japan Advanced Institute of Science and Technology.